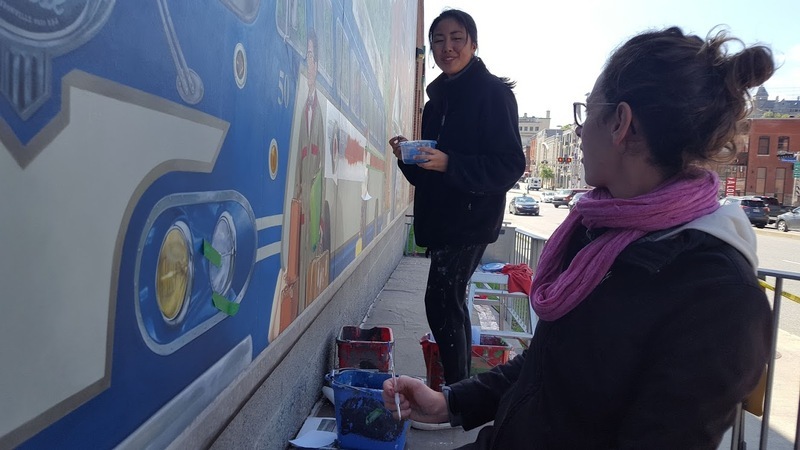 The Terminus and Populus mural is located near the corner of Grandes-Fourches and King, where the Sherbrooke bus terminal used to be a few decades ago. The ideal viewpoint that presents a realistic rendering of the trompe-l’œil effect is located across the street in relation to the mural. Obtaining such a trompe-l’œil effect represents one of the main challenges related to this work according to Serge Malenfant, president of MURIRS. The left part presents the former terminus in Sherbrooke. 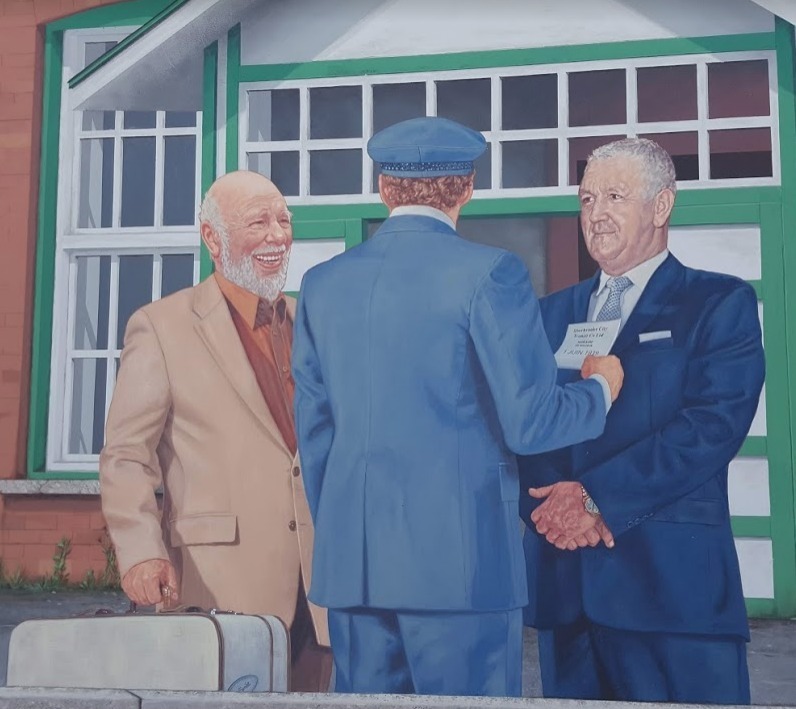 The mural also highlights the places where the local people used to purchase food products, including the former Lansdowne public market, where a variety of regional goods were sold. The murals tour represents nearly 50% of the enquiries at the tourist information bureau in Sherbrooke. There are different ways to discover those murals, the most widely used medium being the guided tour assisted by the BaladoDiscovery application. A little more than 60,000 visitors consulted the Sherbrooke murals tour on BaladoDiscovery over the past four years. Since the foundation of the first restaurant Chez Louis, three generations of restaurateurs, including two generations of the same family, operated those restaurants. 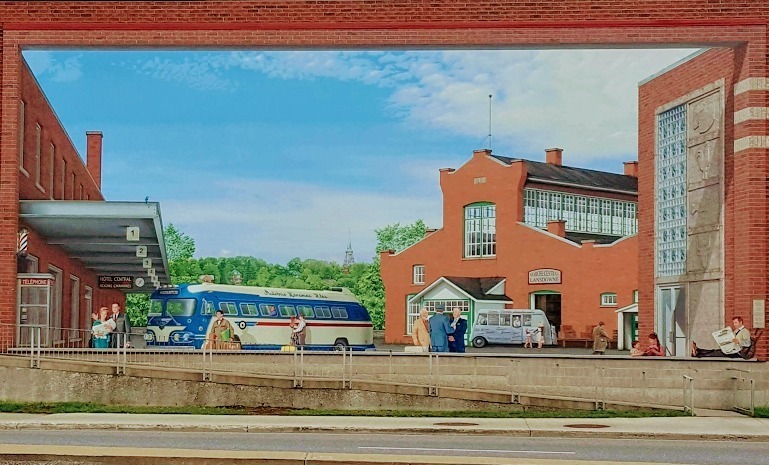 At first, there was the mobile canteen Louis Luncheonette, which was located around the terminus on a daily basis until it was permanently set up near the Aylmer bridge in 1949. The owner of Louis Luncheonette was Louis Balawyder and he was a native of Saskatchewan. 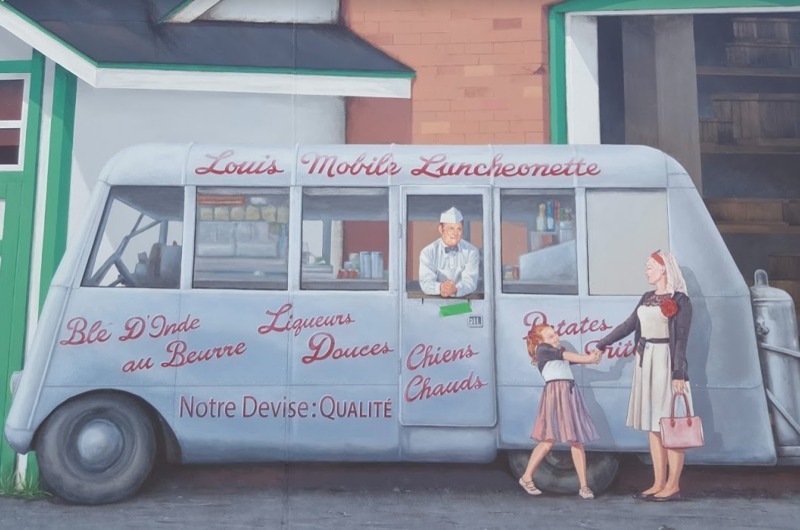 The name Louis Luncheonette was then commonly used by the residents of Sherbrooke over time. Even today, many citizens talk about going to Louis Luncheonette instead of Chez Louis! The terminus is a hub where travellers pass each other. Among them, you recognize Belgian historian Jean-Pierre Kesteman, suitcase in his hand, who came to study at Université de Sherbrooke in the ’70s. Jean-Pierre Kesteman fell in love with the region and decided to settle there, as well as dedicating many works throughout his career. 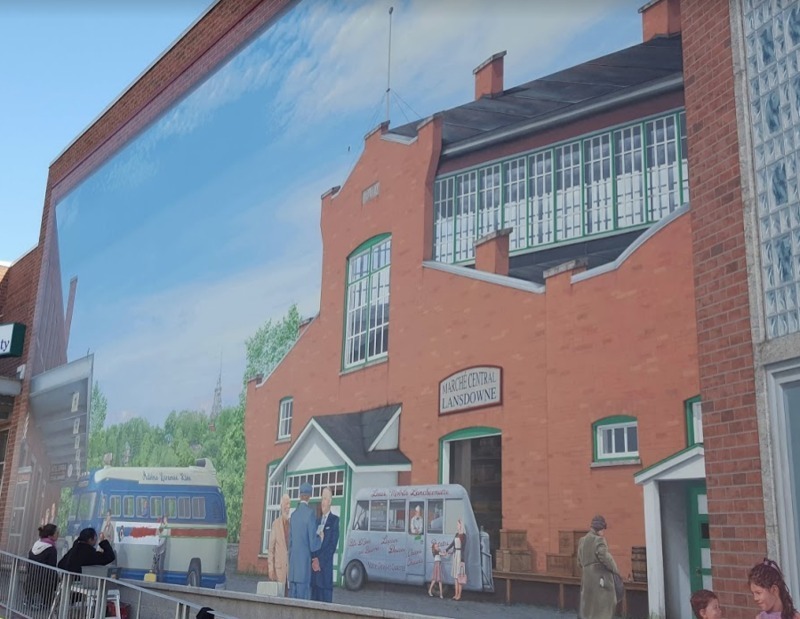 You can see and hear him through various short videos from the Sherbrooke murals tour as well as in other local tours available in BaladoDiscovery. Mister Kesteman passed away in October 2016. The man seen from behind embodies all the bus drivers who did that job. Those drivers who carried the passengers to their destination were, for some people, excellent confidants and good guides. The man on the right side is Alphonse Laramée (1908–1978). This businessman created, among other things, the first bus transport links to several cities in Québec from Sherbrooke. The Search and find game will soon be available for this mural. This observation game is currently available for the other murals in the same tour on BaladoDiscovery.